If you love some tea in the afternoon, then the Langham Place in New York City has just the treat for you. 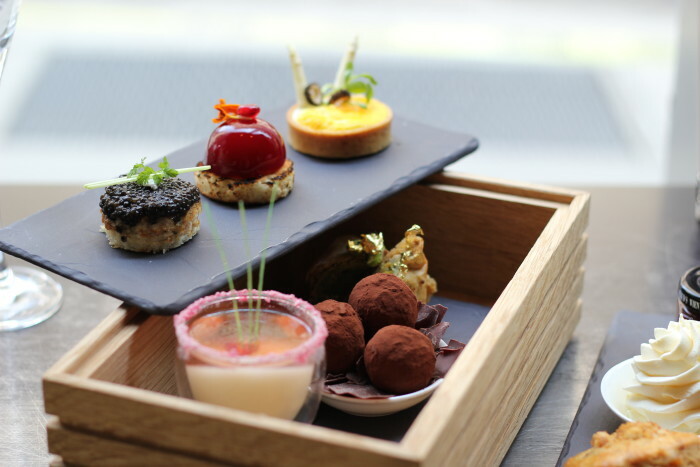 The Modern Afternoon Tea (US$150) was crafted by chef David Vandenabeele and the team at Measure Lounge. Beluga Caviar and Buckwheat Blini. Ginnger Nutmeg and Orange scones with Wild Berry Jam and Clotted Cream. This also comes with teas from In Pursuit of Tea, and half a bottle of champagne. As you can see from these images, the food comes in bento boxes. The Langham hotels have always been a favourite of royalty and celebrities, including Princess Diana, Napoleon III, Oscar Wilde, Mark Twain, and Sir Winston Churchill. Famed author Arthur Conan Doyle even used the hotel as a setting in two of his Sherlock Holmes stories. To partake in this special deal, make a reservation 24h in advance.